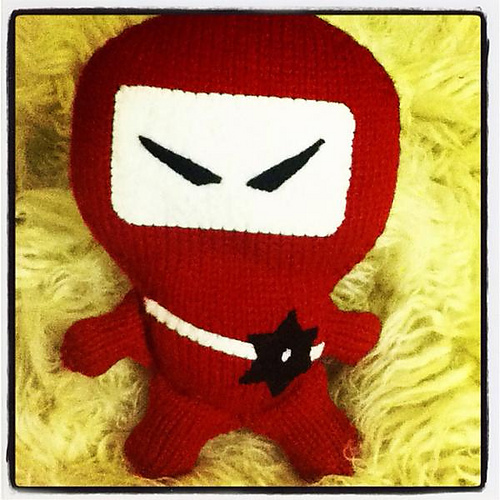 This little bad-boy is the Ninja that Alex asked me for, from the Knitwits book. It's hilarious! He has no idea that I knit it for him, and he's going to lose his business when he unwraps this guy on Christmas morning. Unfortunately, I have to knit two more. For some reason, boys are hardwired to like ninjas, and it appears that they never outgrow that. I knew that Dante wanted a black one, but I had no idea that Aaron was being serious when he said he wanted one too, lol. Sigh. Love this! Isn't that the truth about boys. My boy is 37yrs-old and he's still Ninja nuts! It started when he was five. ???? ?